Ever since the rumors started circulating of a new Nissan SUV late last year, the entire automobile industry has been looking for all the details they could possibly get their hands on. When the Japanese car company finally confirmed the rumors earlier this year, a lot of enthusiasts immediately started to express interest in purchasing one. This has been a long time coming, because Nissan has already made an impact as one of the premier car manufacturers not only in the Asian market, but also in many others around the world. Supporters and fans will be glad to know that the Terra does not disappoint, and not only does it carry a lot of the favorite features of previous Nissan favorites, it also builds upon them, which gives the riders an overall better experience. Almost every facet of the car has been heightened, from the safety and control, to the comfort and design. From the company’s patented Intelligent Mobility System, to the lane departure warning and around view monitor capabilities, those who are interested in purchasing the Nissan Terra have a lot to look forward to in September. There are already a plethora of reviews of specs and features examination from multiple experts on the internet. Instead, what we’ll put out here are some of the things that they don’t really go into much detail but are really what sets the Terra apart from all others. When it comes to how it looks on the outside, the Nissan Terra doesn’t disappoint. Although similar to the Navara especially when examined up front, it still has some features that make it unique, and has a more stylized and mature look compared to its pick-up counterpart. Nissan didn’t go for fancy and unnecessary when they modeled the Terra and did not include a fancy rear, unusually bulging front, and some sort of unique method of using steel to create a show of strength for the Terra. All in all, one could even say that the design is simple, but far from a bad way. Although there are many modern designs that are reflected on the body, like the cameras that are visible around it, the LED headlamps, the multiple sensors and other similar features, overall it is still an honest, straightforward SUV. Despite the more refined design, one could never mistake this for anything else aside from an SUV, as almost every facet of it conveys power and muscle, like the wheelarches, the proportions, and the arguably best-in-class clearance from the ground. True to its name, the Nissan Terra truly looks like a vehicle that is suited for all kinds of terrain, in all kinds of weather and conditions. It’s straightforward design and feel is carried out even when one goes inside. The steering wheel, dashboard, and even the shifter are straight from the Navarra, so those who have driven the Terra’s mechanical twin will definitely sense a feeling of familiarity once they get inside the driver’s seat. Because of its no-nonsense layout, the dashboard continues to be a favorite of many, and the fact that they find it very easy to clean is an added bonus. Despite the similarities though, when you look around the inside of the car, you will immediately notice that it is definitely not a pick-up. The wagon-type body is immediately obvious, and the biggest difference would be the fact that the Nissan Terra is a three-row, seven-seater vehicle. In China, a five-seater option was offered, but our market only stocks the seven-seater variant. Another unique feature of the Nissan Terra would be how one folds the seats in order to get access to the third row. The middle row allows the driver to tumble and fold the 60/40 split seats with a simple push of a button. These buttons are located just off the shifter, which means no fumbling in order to get to the last row is necessary. The third row can also be folded down to make more carriage space by using the usual two straps on the back. These are just some of the features that drivers and passengers of the new Nissan Terra can look forward to. All in all, it provides the dependable, no-nonsense power that the older generation of SUVs had, but it also comes with all the creature comforts and futuristic innovations afforded by modern technology. All in all, the Nissan Terra is a good choice for any driver, whether you use it to go down a dirt road not often traveled, or to go to the city with the family for a night out. Okay, so there has been quite a lot of buzz surrounding the new Nissan Urvan Premium; how huge it is, how amazing the features are for an extra-sized family van, the fuel economy, and so on. The truth is, for most of the young adults, the driving-age teens, vans and SUVs are not really that appealing. These young individuals typically prefer the sedans or the coupé sports car over bulky heavyweights like the Urvan Premium. Fortunately, the Nissan NV350 Urvan Premium, and other similar type of vehicles, is not really marketed to the young drivers. Vans and SUVs are aimed to the adventurous family guy who’s more concerned about comfort and safety rather than speed and sleek appearance. If you are this type of person, someone who appreciates comfort, safety, and economy in the vehicle he’s driving, then here are five reasons to buy Nissan NV350 Urvan Premium and treat your family to an amazing adventure, even if it’s just a short ride to school or the shopping center. Why Buy the New Nissan NV350 Urvan Premium? It is so massive that other similar type vans will look like mini-vans next to it. In this case, size really does matter. The new Nissan Urvan Premium is considerably larger compared to its predecessors. It’s taller, wider, and roomier in comparison to a lot of other similar type vans in the market. 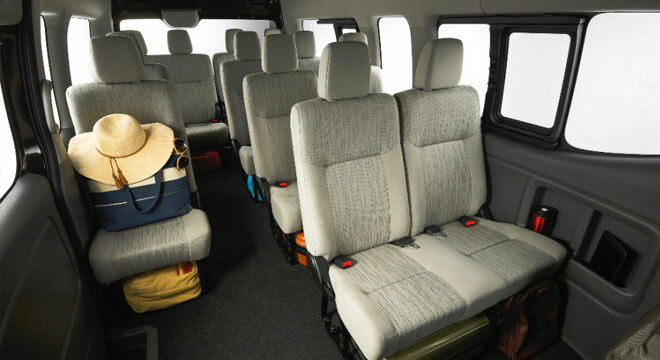 The Nissan NV350 Urvan Premium is a 15-seater, so it can definitely handle bigger families with eight or even 10 members. As for drivers and passengers on the heavier side, the Urvan Premium has a lot of legroom, enabling you to move about inside the cabin with relative ease. If you’re looking for power, this van definitely has it. Vans are designed to carry multiple passengers, and their luggage, from point A to point B. But the secret to ensuring a comfortable and relaxing journey is the vehicle’s ability to utilize its power at the right moments. The NV350 Urvan Premium boasts of a VGS turbo providing additional power to its 2.5-liter diesel engine, giving this beast of a machine a comfortable 356Nm torque power. Not too shabby for a vehicle that’s mainly marketed as a family van, right? So if you want power to match incredible design, the Urvan Premium is definitely it. It offers maximum comfort and luxury that no other vehicle of its caliber can provide. The level of comfort a vehicle provides has always been a significant deciding factor when it comes to choosing a ride of this caliber. Compared to similar type vans available in the market today, the NV350 Urvan Premium is definitely on a league of its own in terms of comfort and luxury. Traveling long distances, on Philippine roads that can sometimes get rougher than usual, is made easy and relaxing with the various passenger amenities that come with this premium model van. And the air conditioning system! If you are into cars and car brands, you know that Nissan is quite well-known for its amazing air conditioning system, among others. It offers great functionality and versatility. A fusion of functionality and versatility in an all-in-one package—that is what the NV350 Urvan Premium is all about. The latest of a long line of well-designed Nissan vans is not just awesome for those long-distance road trips with family and friends. It’s also an excellent utility vehicle for doing errands around the city. Do you want a fuel-efficient vehicle to take the kids to school every day? Drive the missus to the mall or to work? What about for delivering or picking packages for your business? The new Nissan NV350 Urvan Premium can be as functional and versatile as you need it to be. Whether they are aware of it or not, every single car buyer is ultimately looking for one thing when it comes to buying an automobile, and that’s value. Is the vehicle truly worth its price tag? Does it offer anything else besides four wheels and a couple of bucket seats? For PHP 1,650,000 the Nissan NV350 Urvan Premium offers so much more value than most of its competitors in the market. Considering what the vehicle brings to the table in terms of comfort, fuel-efficiency, luxury, and safety, it’s an investment that’s truly worth making.